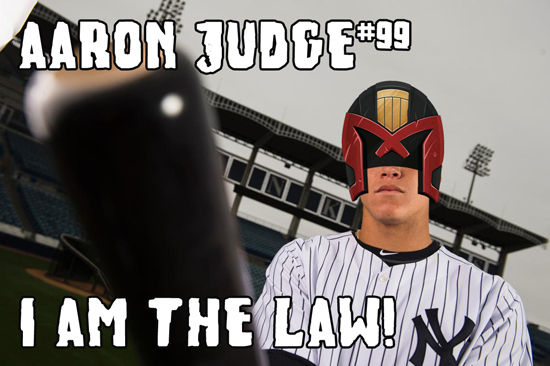 Announcers have taken to declaring it "Judgement Day" when Aaron Judge hits a home run, which seems way more bleak than aligning him with Judge Dredd, as I have above. His walk-up music should be the Anthrax track about the 2000 AD anti-hero! On to things people beyond myself and other fans of the Bronx Bombers care about, we're just two days away from Free Comic Book Day! Next door you can pick out 6 (or 8 if you're a subscriber) books from the 50 available official FCBD titles, and we'll also have 10,000 $1 comics for you to peruse as well as a selection of $5 (or 5 for $20) Funko Pop and Mighty Mugg figures! Then you can come into the shop to enter to win a commission quality piece of artwork from Chris Giarrusso, Jacob Chabot or Gregg Schigiel or an original comic page, plus we'll be running a SALE - buy two, get one FREE on all graphic novels and toys! Plus, tonight we'll be set up starting at 6:15 at the RED Cinemas and Carmike 18 (now AMC Classic 18) with giveaways and a chance to win a Gentle Giant San Diego Comic Con International exclusive Rocket Raccoon bust (enter at either location)! AD After Death #3 - the final installment of Scott Snyder and Jeff Lemire's oversized experimental sci-fi opus ships, a must for people that have enjoyed Lemire's Roughneck original graphic novel! Batman/ TMNT Adventures #6 - final issue! Bug the Adventures of Forager #1 - new from DC's Young Animal, this one harkens back to the '70s Kirby era of Kamandi and the New Gods and should be a ton of fun while looking amazing with artwork by Mike Allred! Godshaper #2 - thoroughly enjoyed the world establish in #1! Grass Kings #3 - copies of the nationally sold out, not-to-be-reprinted #1 available on the shelf now for cover price! Green Valley #8 - penultimate issue! Lazarus Sourcebook #2 - I've gotten my dad reading this one since we opened! Rock Candy Mountain #2 - the most fun you'll have with an Image comic since the Fix! Secret Warriors #1 - I dug this book when Jonathan Hickman wrote it after Secret Invasion and 4 Kids Walk Into A Bank's Matthew Rosenberg has never disappointed! Silver Surfer #11 - a double shot of Allred art next week! Star Trek/ Green Lantern #6 - final issue! Star Wars Screaming Citadel #1 - kicking off the five part crossover between the main title and Doctor Aphra! Titans #11 - part 1 of the Lazarus Contract crossover between Titans, Teen Titans and Deathstroke! X-Men Blue #3 - as well as reprints of X-Men Prime #1 and the now sanitized X-Men Gold #1!